Surely one of Sinclair's most unusual products, the strange-looking Wrist Calculator (right, being worn) was launched in February 1977. It was the first product of Science of Cambridge, the company which came between Sinclair Radionics and Sinclair Research. 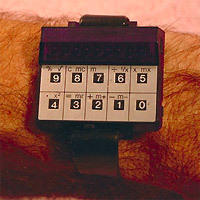 In some ways it was ahead of its time, anticipating the LCD calculator watches of the 1980s. The Wrist Calculator was assembled by in-house designer John Pemberton out of redundant calculator chips and displays, mounted on a little printed circuit board with half a dozen of the smallest cells available to power it. The result was described uncharitably (if accurately) as "an eyesore in black plastic". Amazingly, it actually came in kit form (right) - Sinclair evidently had not learned the lessons of the Black Watch fiasco. Not surprisingly, given the tiny components, it was extraordinarily tricky to assemble. Once completed, there was only a fair to middling chance of it working. John Pemberton recalls that it was designed to "minimal tolerances", which meant that only if one was lucky enough to get a set of parts all of which were at or below the mean size of the prototype's components could one get it to fit within the case. 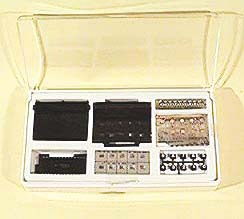 It was not uncommon for the parts to be the wrong size, making the device impossible to assemble. Even so, more than 10,000 Wrist Calculators were sold to masochistic hobbyists from all parts of the world, for a revenue in excess of £50,000. Another 20,000 were exported to the United States, though sales there were dismal and much of the exported stock was returned unsold to Sinclair.